The purpose of this project was to take the golden ratio or Fibonacci sequence and create a sixteen foot cube based in that. We got three sizes of planes that we could piece together based on the radius of the different arcs in the golden ratio. We were supposed to create a primary space, a secondary space, and make whatever leftover space there was interesting. In all our drawings and models, it was scaled down to a 1 inch scale. We weren't actually going to build a sixteen foot cube. We create three different three plane models to see which was the most dynamic one. The one we chose became a part of the eventual Fibonacci cube. But before that could happen, we had to do drawings of it. 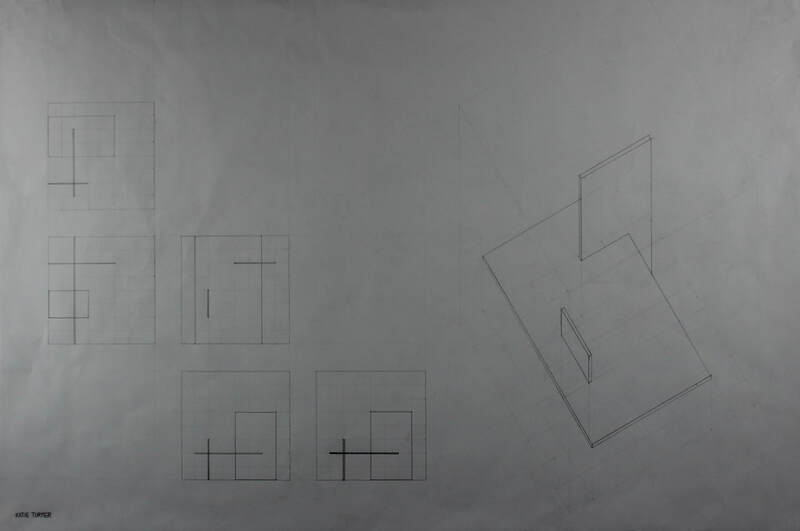 The 20x30 drawing above is a section, an elevation, a floor plan, and an oblique of the three plane model we chose. Strangely, my third creation was the one I chose. The other two had the largest plane at a vertical angle, and I feel like it just blocked off a lot of space. Therefore I went with the horizontally oriented one. The final cube was put together using my chosen three plane model and two more sets of each plane. The highlighted blue portion would be the original planes, also my secondary space. The space above that, I call it my balcony, but it's the primary space. Every other part is a resultant space, but still interesting in their own way. All the basswood sticks do is define the spaces I created, but for my floating piece they really emphasize the fact that it's only attached at the top.